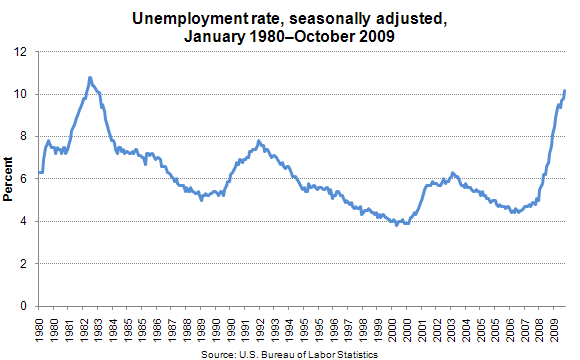 In October, the unemployment rate rose by 0.4 percentage point to 10.2 percent, the highest rate since April 1983. Since the start of the recession in December 2007, the unemployment rate has grown by 5.3 percentage points. In October, 35.6 percent of unemployed persons were jobless for 27 weeks or more, while 20 percent of the unemployed were jobless for 5 weeks or less. Among the major worker groups, the unemployment rates for adult men (10.7 percent) and whites (9.5 percent) rose in October. The jobless rates for adult women (8.1 percent), teenagers (27.6 percent), blacks (15.7 percent), and Hispanics (13.1 percent) were little changed over the month. These data are from the Current Population Survey and are seasonally adjusted. 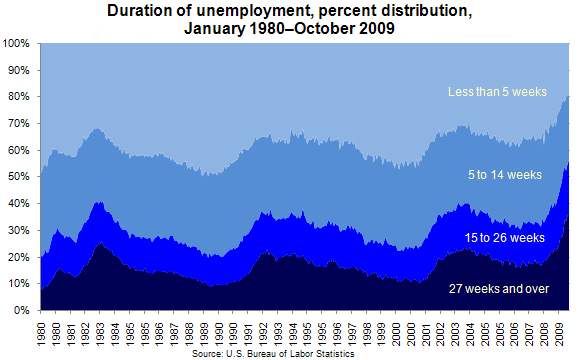 For more information, see "The Employment Situation – October 2009," (HTML) (PDF), news release USDL-09-1331. Bureau of Labor Statistics, U.S. Department of Labor, The Economics Daily, Unemployment in October 2009 on the Internet at https://www.bls.gov/opub/ted/2009/ted_20091110.htm (visited April 21, 2019).